Five of us had a fine 8-mile hike up West Stoppel Point (3100 ft.), near Lake Capra & Colgate Lake in the NE Catskills. This was something new and interesting. The ridgeline summit of this mountain, which lies west of Stoppel Point on the Escarpment Trail, was a really nice walk because the woods are open and there are views of the Blackhead Range when the leaves are off the trees. After we came down, we found a beautiful frozen waterfall on the East Kill, which dumps into Lake Capra. Here’s a picture of it. There’s also a group “selfie” taken on the summit. April 6, 2013: Fourteen of us met on this early spring weather perfect day to hike the Stillman Trail from Mountain Road to Route 9W, offering along the way several beautiful views of the Hudson River, on to Butter Hill where we enjoyed a lunch break overlooking the Hudson River. While sharing lively conversations, delicious homemade treats (smoked sausage and jerky) were passed around by some participants. 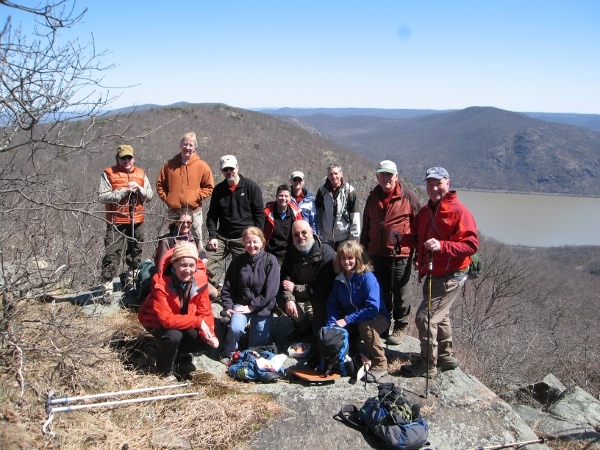 members of ADK are all very friendly and welcoming.” –Hike leader Jean-Claude Fouere. 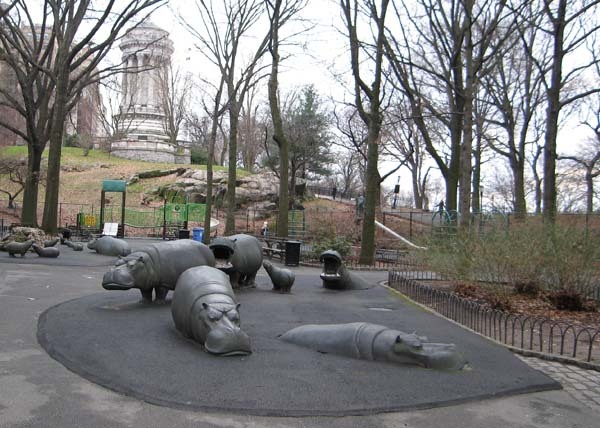 Wildlife in The City: The Hippo Playground in Riverside Park. An eager group of MHADKers filled a Metro-North train car early Saturday morning and headed to the Big City for an urban park adventure. This was the first in a planned seven-hike series along the Hudson River, from Manhattan to Lake Tear of the Clouds in the Adirondacks, organized by Jean-Claude Fouere. For more photos of the day, click here to go to the co-leader’s Flickr page.